People treated by an air ambulance have been asked to get in touch as the charity marks its 25th anniversary. The Lincs & Notts Air Ambulance has completed more than 19,700 missions since it became operational in 1994. Bosses said patient stories show how the service, which costs £2.5m a year to run, can be the difference between life and death. 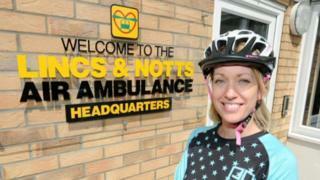 Nurse Sarah Layden, who suffered head injuries while cycling in a park, said: "Without it I wouldn't be here." Ms Layden was cycling with friends in Bestwood country park in 2014 when she crashed. "I fell 30 feet and landed on my head and suffered a traumatic brain injury. "Because we were in a disused quarry, there was no access for the land crew to get to me. I was unconscious and my partner was panicking. "I wouldn't have survived had I not got to intensive care so quickly, without it I wouldn't be here," she said. Karen Jobling, the air ambulance's chief executive officer, said: "It is so important for us to share the stories of our former patients, as it highlights how vital our life-saving service is within our local communities, while recognising the amazing work of our crews who attend these potentially life-saving missions daily." Ms Jobling confirmed there were plans to run a 24/7 service - as opposed to the current 07:00 to 19:00 cover - which will push running costs to £4m a year.